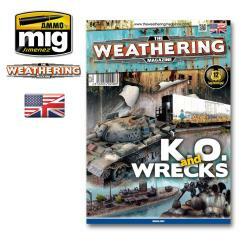 #9 "Thunderstruck, Remembering the 4th of July, Burn Out Effects"
The only magazine in the world devoted exclusively to the weathering effects and paint in general for all kinds of modeling. This issue is dedicated to destroyed, abandoned, and sunken vehicles. The best modellers in the world will offer a repertoire of exceptional examples and they explain with detailed step by step process, all the newest tricks and techniques to get your models represent similar conditions. From a totally abandoned "Walker" futuristic robot, a wooden sunk boat, a Tiran 5 absolutely burned or a jet fighter abandoned in the open. But you can also discover how to burn impacts and effects on a King Tiger or a weather a train wagon full of graffiti. TWM is a collectible magazine, 64 pages, printed on high quality glossy paper and full of useful items for any field of model. Available in 7 different languages, this is the most international magazine in the world.